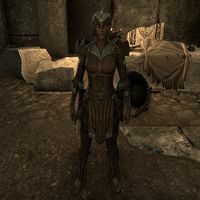 Lanath was an Ayleid servant of Meridia who was part of the Knights of the Gleaming Blade. The team was tasked by High King Cenedelin of Delodiil with razing the city of Abagarlas, destroying the Mortuum Vivicus, and hiding the Prismatic Crystal in the Dwemer ruins of Mzeneldt. 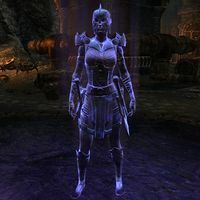 She was once the Exarch of Molag Bal in Abagarlas, and credits Endarre with helping her see the manipulations of King Anumaril and defecting to Delodiil. She later perished in the ruin, and recounted her experiences in her journal. Curano: "The undead are close behind us. We must hide the remains of the weapon. Now. Lanath: "The automatons are still active. We'll die down here! Curano: "We will see this done, or Molag Bal's hunters will chew on our bones. Endarre: "Curano is right. With any luck the constructs will hold back the dead! Lanath: "I still think this plan is madness." Guildmaster Sees-All-Colors "Those were Ancient Ones. 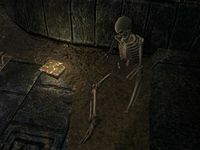 Ayleids in a Dwemer ruin. What went on here?" Lanath: "Damn it! Curano is dead. The weapon will be lost forever." Endarre: "No, there's still hope. Ostarand will have to do it." Ostarand: "Oblivion take you! I can't." Valasha: "We can still succeed. But you'll have to enact the sacrifice, my friend." Endarre: "Without a soul in the crystal, there will be no way to repair the weapon. It must be done, Ostarand." Ostarand: "We barely survived the last wave. Valasha's injured. We'll never hold against the dead and the constructs." Lanath: "Ostarand is right. You need time. I'll lead the dead away, down another branch in the tunnels." Endarre: "Lanath, don't! You'll never survive the swarm!" Lanath: "If my death buys you the time it needs... For Delodiil! And Meridia!" When interacting with Lanath in Abagarlas, she cannot be spoken to but will say generic friendly greetings. This page was last modified on 11 August 2018, at 20:51.